Jeff Skinner scored a goal Tuesday night. Imagine that being big news for the first 4 1/2 months of this season. For much of that time Skinner was battling Washington's Alexander Ovechkin for the NHL lead in goals. But much like his team, Skinner's season fell off a cliff. 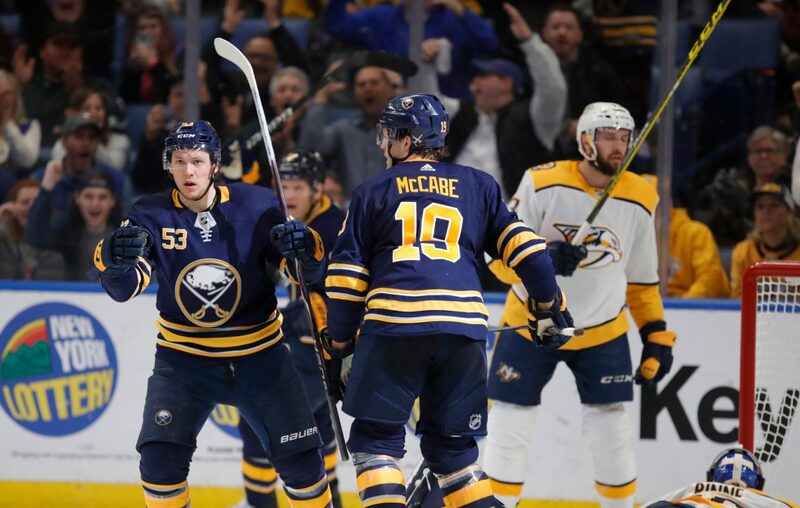 He got his 38th of the season in the second period of Tuesday's 3-2 loss to the Nashville Predators in KeyBank Center and it was a looooooong time coming. Skinner had not scored at home since Feb. 15. He had no goals in his last eight games and just one in his last 22. No. 38 was a significant one though, as it gave Skinner a new career high and left him in position to get to 40 for the first time in his career with two games left in Buffalo's season. "It's been a while so it's nice to get a goal," Skinner said. "You need to score to win games. It's frustrating to not get a win. It's been a while for me." 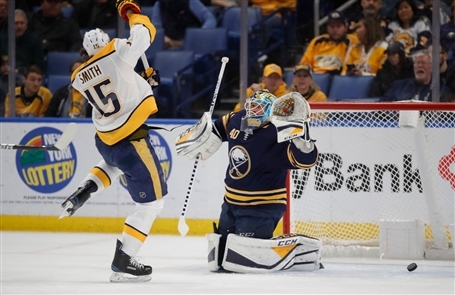 Skinner capitalized on a fortuitous bounce off the back boards of a Brandon Montour shot to beat Nashville goalie Pekka Rinne. Playing on a line with Kyle Okposo and Evan Rodrigues, the line scored both of Buffalo's goals. "Our line played pretty well. We created some chances and it was a good bounce off the boards there," Skinner said. "The frustrating part is part of my job is to produce offensively and contribute to the team that way and help the team win that way. I haven't been doing that." Imagine how tough the last few weeks have been for Skinner. He suffered that horrid looking ankle or knee problem in the game against Washington on Feb. 23 and suddenly stopped scoring. You can't automatically say the two are related either because Skinner has still been getting plenty of shots on goal -- with 57 coming in one 16-game stretch where he scored only one goal. "Skinny has done that all year for us," Okposo said. "I know the puck hasn't gone in for him lately but he's always there, always around it." "It's good. That line really played well for us," said coach Phil Housley. "It's good to see Jeff finally find the back of the net. He's had his opportunities and you can see how important his goal scoring is for our team. We're right there until the end. While the Sabres have been historically cratering with one win in 16 games, the Carolina Hurricanes have become a talking point in the league. They're looking like a good bet to go to the playoffs for the first time since 2009. Skinner played in his 659th career game Tuesday night and he's the active leader in games played without making the playoffs. And now his old team – the one he put everything on the line for over eight seasons before they foolishly dumped him in August – could be going to the postseason without him. "For me, my focus is here. I'm on the Sabres. I'm part of the team and obviously we didn't reach our goal," Skinner said. "We still have two games to battle, work for each other and compete out there and try to win. That's what you try to do. You're an athlete. Everyone in here is competitive. No one likes where we are." And no one knows where Skinner is with his new contract as well. He's probably cost himself a good chunk of change with this slump as a 54-goal scorer would obviously get quite a bit more coin. Skinner and the Sabres aren't doing any negotiating in the media for a long-term extension but it's safe to say most outside observers figured this would be done a long time ago. It will be interesting to see if the Sabres' second-half collapse will sway Skinner's mind. Tuesday's game was the kind of effort that Skinner and the Sabres should have been producing much more often. They were outmanned against a superior team but didn't wilt when adversity struck. About time. New Niagara coach Patrick Beilein and his father, Michigan coach John Beilein, were in a suite watching on Patrick Beilein's first day on Monteagle Ridge. Patrick Beilein promised a Sabres win Tuesday morning and what seemed like an outlandish throwaway line given the quality of the opponent wasn't so far-fetched after all. Clearly, the younger Beilein does not lack for optimism, a trait he’ll need in turning around the Purple Eagles. And he got rewarded by seeing what was easily the Sabres' best effort against a good team since the shootout win over St. Louis 2 1/2 weeks ago. The Sabres were hard to play against, with 21 hits to Nashville's 13. The shots on goal (35-28) and shot attempts (62-57) both favored the Predators, but hardly by a huge margin. So it was infuriating to Housley that the Sabres were on the short end of two key calls in the game. Craig Smith's first-period goal to open the scoring might have been directed in with a high stick but the NHL ruled as "inconclusive" replays that clearly showed the puck hitting Smith's stick on the shaft between his hands. Without a ruling it hit the stick, a high sticking determination was pointless. In the second period, Conor Sheary scored to apparently pull the Sabres into a 2-2 tie but officials prematurely whistled the play on a delayed penalty to Nashville's Ryan Johansen. It was a terrible call because the only Predator who touched the puck was goalie Pekka Rinne, and that was to make a save and not earn possession. "It's frustrating because we got screwed," Housley said pointedly before calling the disallowed goal "mind-boggling." He was dead right. Imagine if the Sabres were in a playoff race. As it is, calls that went the Predators' way aren't going to be looked at too kindly in places like Winnipeg or St. Louis. Nothing going the Sabres' way for a long time. Kind of fitting for this season.